In spite of the many confusing relationships within the order, there is still a great deal of information that is known about the phylogeny of passerines. The two broadly defined suborders, oscine and suboscines, are rather easily separated, primarily on the basis of differences in the architecture of the syrinx, the special structure that birds use to produce sound. In oscines, the so-called songbirds, there are more than three pairs of intrinsic syringeal muscles, while the more primitive suboscines have much less elaborate musculature. In spite of the complexity of the oscine syrinx, however, the musculature is very uniform throughout the suborder, which strongly suggests a monphyletic relationship among the species. On the other hand, the syringes (plural of syrinx) of suboscines are much more variable in design, and monophyly is suggested by a unique middle ear ossicle design that is highly uniform among suboscine species. The complexity of the syrinx, as well as the fossil record, suggests that oscines are more evolved than primitive sub-oscines. In fact, oscines are considered to be among the most advanced of all bird species. As a result, they are traditionally placed at the very end of taxonomic lists of avian orders. Three groups of birds, New Zealand wrens (Acanthisitti-dae), Australian lyrebirds (Menuridae), and scrub-birds (Atri-chornithidae), are highly problematic when it comes to classification. Prior to 1975, these were considered to be su-boscine, however, some later researchers placed them in the oscine suborder. Given the primitive nature of these birds, however, this has not been entirely satisfactory, with some researchers suggesting that they should be placed in separate suborders. OLD WORLD SUBOSCINES The most primitive suboscines (excluding the controversial New Zealand wrens) belong to three families found in the Old World: broadbills (Eurylaimidae), pittas (Pittidae), and asities (Philepittidae). Broadbills are brightly colored, arboreal, insectivors, and frugivorous birds that occur in Africa and Asia. Pittas are brightly colored, chubby, ground-dwelling carnivores found in Asia, Maylaysia, and parts of Africa and Australia. Asities resemble pittas in size, shape, and coloration, and feed on nectar and insects. 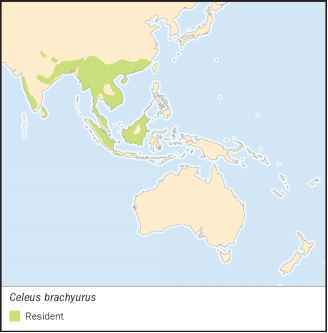 NEW WORLD SUBOSCINES New World suboscines are often subdivided into two superfamilies, the Furnarioidea (ovenbirds, antbirds, tapaculos, and woodcreepers) and the Tyrannoidea (flycatchers, sharpbills, plantcutters, cotingas, and manakins). This subdivision as a formal classification is controversial, though it is not in dispute that these two groups, informally at least, represent two major radiations of South American passerines. Tyrant flycatchers, the largest family in the suborder with more than 300 species, have a number of different body shapes owing to the diversity of their feeding strategies. Cotingas are medium-sized frugivores with broad bills. Man-akins, also broad-billed frugivores, are small, with stubby tails and wings. Passeri, or songbirds, make up about four-fifths of the passerine order with anywhere from 4,100 to 4,500 species. Although extensive adaptive radiation of oscines has produced a wide variety of ecotypes, the morphological features that are used for classification in this order are very uniform, making it difficult to assign them to families and genera with certainty. Many researchers have adopted Sibley's and his colleagues' classification of oscines, though more work will undoubtedly refine the systematics even further in the future. Sibley and Ahlquist, using DNA hybridization, have subdivided Passeri into two broad groupings, the parvorders Corvida and Passerida, each further subdivided into three su-perfamilies. The parvorder Corvida consists of crows and allies, further subdivided into in the superfamilies Menuroidea, Meliphagoidea, and Corvoidea. The sister group Passerida consists of Muscicapoidea (thrushes and allies), Sylvioidea (sylvoid oscines and allies), and Passeroidea (oscine weavers and allies).